The first confirmation that, despite the reassuring words of the Army 2020 document, the Attack Helicopter Force was going to face significant change came in November 2012, when Col. Andrew Cash, aviation commander, 16 Air Assault Brigade, spoke about the future of the Apache and exposed the planning for the passage to a 4 + 1 squadrons structure. Those plans have now progressed enough that the first Apache squadron has been disbanded: 654 Sqn, 4 Regiment AAC, had its disbandment parade on July 8. 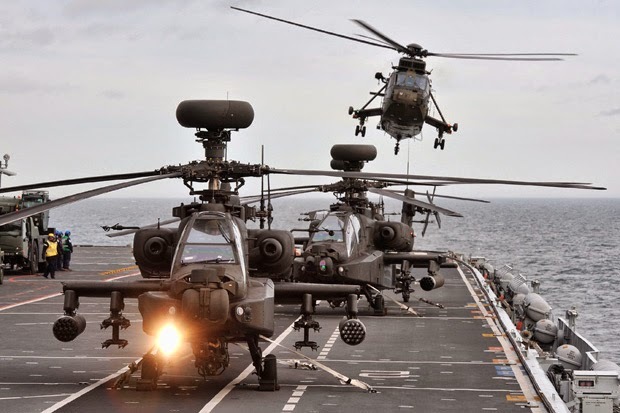 Until then, the Attack Helicopter Force, based in Wattisham, was composed of the two Apache regiments (3 and 4 Rgts), each with three frontline squadrons. These mono-type squadrons were the result of a rethink, in the early 2000s, of an earlier plan which would have seen 9 Regiment also roled as an Attack formation. In that iteration of the plan, each regiment would have had two squadrons of Apache and one squadron with Lynx. Logistically, however, it was simpler to concentrate the fleets together in mono-type formations, and so the eventual result was two regiments wholly on Apache, and 9 Rgt wholly on Lynx, with the 1st Rgt based in Germany with a further two squadrons of Lynx helicopters tasked with intimate support to 1st (UK) Armoured Division. It is of some historical interest remembering that the original plan for the attack helicopter called for 91 machines to equip 9 squadrons, one of which would be 847 NAS, to ensure that 3rd Commando Brigade would have its attack helicopter support. In the end, however, 847 NAS was not to see the Apache, and the army would only be able to equip 6 instead of 8 squadrons. The UK purchased 67 Apache helicopters, with the first 8 assembled at the US plant in Mesa, Arizona, and shipped to the UK beginning in September 1998, before Westland assembled the remaining 59 in the UK under license. The UK purchase included 68 Longbow fire control radars, 1 Full Motion Simulator, 4 desktop simulators and 2 Field Deployable Simulators. In reality, the training fleet is larger. In 2011, 13 helicopters and 18 instructors made up 673 Sqn. The assignment of the machines is more flexible than the paper suggests. In 2012, besides, one Apache was written off following an extremely hard landing, leaving 66 in the fleet. Hard, constant usage because of operation Herrick has also taken its tool on availability: on 1st April 2013 only 38 Apaches were in the Forward Fleet, including the training fleet and those deployed on Herrick detachment. 3 and 4 Regiment AAC have borne the burden of a constant presence in Afghanistan for all these years, by adopting a two-year cycle that sees one Regiment committed to operations and one in supporting role. For example, in its operational year, 4 Regiment would cover the 12 months by deploying each of its three squadrons for a 4-month tour, modelled on RAF guidelines (which have been selected by Joint Helicopter Command, the higher authority the AAC responds to). In the same 12-months period, 3 Regiment, in the supporting role, would deliver Mission Rehersal Exercise (MRX) support to troops preparing for deployment; Operational Conversion Training and a token Contingency force available for new operations, such as Op Ellamy in 2011. One squadron on rotation between the three in the Supporting regiment would be tasked as Conversion To Role (CTR) unit, inglobating the Air Manoeuvre Training and Advisory Team (AMTAT). The Squadron would also hold Station Airfield responsibilities, looking over Wattisham, and would deliver training for shipboard operations, delivering Deck Landing Qualifications (DLQ). Effectively, this arrangement was considered a 5 + 1 solution of five deployable squadrons and one training unit. The Apache pilots, after completing their initial training or after coming from another type, move to 673 Sqn in Middle Wallop. This is the Apache Conversion To Type training squadron, which delivers 8-months training courses to form the crews of the attack helicopter. Achieving conversion to type, however, is not at all the end of the training. Conversion to Role prepares the crews for actually flying combat missions. Under Army 2020, if the plan hasn't been revised further, the idea seems to be to reduce the Attack Regiments to binary formation, with two squadrons each, in line with the new binary structure of 16 Air Assault Brigade. In addition, one squadron, while no longer frontline tasked, would remain as CTR unit: this could be, judging from the fate of 654 Sqn, the future of whatever squadron will be selected within 3 Regiment AAC once involvment in Herrick is over and the regiment is restructured to its binary Army 2020 structure. The Attack Regiments will continue to alternate on a 12-months basis, with one regiment at high readiness for one year. The two squadrons of the regiment will have different focus: one will be prepared to deploy on land in support of the Airborne Task Force (ABTF) and one will qualify for shipboard operations to support the amphibious Response Force Task Group (RFTG). The regiment will provide a deployable HQ as well. The Army's promise on disbandment of 654 Sqn is that manpower and helicopters within the Regiment will be maintained, and just spread on two instead of three squadrons. This would in theory mean increasing the strenght of each squadron to 12 helicopters. I sincerely don't thinks this is actually the case. As operation Herrick ends and 3 Regiment AAC ends its last year committed to Afghanistan operations, the Attack Helicopter Force will complete its restructuring, and if a fifth squadron will effectively remain to be tasked with CTR training, the squadrons won't have more than 9 or 10 aircraft at most, assuming a Frontline fleet of 48 is maintained. And it probably won't be maintained for much longer. The latest Apache logistic support contract signed reportedly includes instructions on how the total fleet will, in the coming years, shrink from 66 to 50 helicopters. A mention in a written answer in Parliament again mentions the 50 figure as the "Army 2020 requirement". The next big question is how many upgraded helicopters the AAC will get when the Capability Sustainment Programme for Apache is started. It would appear that 50 is the target, and we have to hope the numbers don't drop further. It is widely expected that the AAC will want to have its Apache rebuilt to AH-64E (Block III) standard; or that it will purchase brand new block III helos. The rebuild option is considered the favorite, since the US Army is paving the way with the reconstruction of hundreds of early block Apaches to bring them to Block III standard, at costs significantly inferior than those of new buys. However, the british Apache is based on the old american Block I and comes with a number of british specific modifications which might prove a bit of an issue. I've covered the Apache CSP issue in earlier articles, and the most recent update is available here. Spectacularly under-reported and almost unknown, the Army Air Corps fixed wing component never seems to make the news, but has received substantial investment from 2003 onwards, suggesting that, as at times happens in defence, silence does not mean the force is disappointing expectations. The Army Air Corps has a fleet of 15 light aircraft of the Britten Norman Islander and Defender types. These aircraft are flown by 651 Sqn, part of 5th Regiment Manned Airborne Surveillance AAC. In reality, so little is known about the squadron that the number of 15 aircraft, albeit appearing in a MOD publication, is controversial. The very same report in fact suggests that the Regiment actually has a fleet of 9 Defender and 3 Islander, with a fourth due for delivery this year. 9 + 3 most evidently does not give a total of 15. A possible explanation is that the number of 15 (rising to 16 this year with the latest delivery, it would seem) is obtained by actually counting in the Islanders CC.MK2 and MK2A with RAF markings that fly out of Northolt. These Islanders, equally hush-hush, have been observed above London many times, and the RAF eventually admitted that an Islander flight is based there. Two such aircraft are now "declared" on the website by the RAF, but it is thought that there are actually 3, with the third added since 2008. Spotters are merciless, and there is no flying in and out of Northolt without being photographed: internet will easily give back photos of the Islanders ZH536, ZF573 and ZH537 if you make a search, yet the RAF website, ever since 2007, stubbornly reports only two aircraft, and with serials messed up: ZF563 and ZH 537! Including these Islanders, which are thought to be used in support of anti-terrorism COMINT/ELINT surveillance, the two totals of 15 or 16 aircraft are indeed reached. The 651 Sqn acquired originally 7 Islanders AL.MK1 many years ago: they were used for aerial photo reconnaissance over Northern Ireland during Operation Banner. In the years, however, the squadron has renewed its line, and now flies mostly newer Defender 4000 AL.MK1 and AL.MK2 (8 aircraft) plus a T3 for training. The first 4 Defender 4000 were purchased as UOR for Operation Telic. Ordered in 2003 and delivered in 2004, they were used in Iraq, carrying underwing DAS pods for self defence and a EO/IR turret under the nose. The Defender was used in Afghanistan as well, between 2010 and 2012. Today, the squadron maintains a total of 6 Task Lines equipped with Defender and Islander aircraft: 5 task lines available for homeland taskings and one for global contingencies. The aircraft are used often in support to exercises and training providing imagery intelligence and communications support, and in support of Police Service Northern Ireland, homeland security (they were active to cover the Olympic games, for example) and support to civil authority in emergencies. The Gazelle remains in use to this day, despite being so old. In April 2013 the Forward Fleet counted 11 machines, excluding those used by 29 Flight BATUS in Canada and those still available for Special Forces support in 8th Flight AAC (658 Sqn since 2013). Their role in support of special forces is of course secret, while in BATUS the Gazelle delivers CASEVAC, range safety control and C2, plus ISTAR support to the formations in training. The total fleet numbers up to 35 machines still, but probably only around 20 are actually in use. 2 Gazelle MK1 helicopters are still providing valuable service for test and development purposes in 667 Sqn, Middle Wallop: this year, surprisingly, they are due to test flight some components of the F-35 mission system no less. Most likely their most ambitious test task ever! Gazelle is still used in support of UK training and other homeland tasks. It is flown by 665 Sqn, 5th Regiment AAC. In its most "full-optional" incarnation it has been seen fitted with a large MX-15 EO/IR turret and a Nitesun searchlight. The Gazelle has its OSD set in 2018, and a support contract in place covering its residual life. In April this year, a contract was signed to roll out a limited but important upgrade on an undisclosed number of Gazelle helicopters: the contract will add a Traffic Alerting System, an electronic Primary Flight Display, GPS navigation and 8.33kHz VHF communication. Conversion To Type training for Gazelle is delivered by 671 Sqn AAC. The big question is what happens when Gazelle goes out of service. One interesting news by AirForcesDaily, back in May, might actually give an hint of one of the possible solutions for the future: a Squirrel HT.2 from 670 Sqn AAC, the Operational Training unit, was seen being trialed with a mission fit comprising an MX-10 EO/IR turret. The trial, described as an assessment of whether the Squirrel can take some of the simpler tasks off the shoulders of Wildcat, actually makes me think this could be one idea for replacing Gazelle in its various supporting roles. The requirements currently covered by Gazelle, in fact, are not going to all vanish together with the old helicopter, even if one role that has been vital in the last years will probably lose relevance: Gazelle and other helicopters have "impersonated" UAVs and delivered full motion video ISTAR to troops training in the UK prior to deployment. It is now hoped that, with Watchkeeper entering service and being cleared to fly, this kind of service will no longer be required. In addition to 657 Sqn, flying Lynx as part of Joint Special Forces Air Wing, which i will cover in the "Wildcat" section of this article, the AAC provides another squadron, 658 AAC. Previously known as 8th Flight, it was given squadron dignity on 1st September 2013 after receiving a fifth, additional Dauphin helicopter for urban operations. It possibly still operates a number of Gazelle helicopters as well. Gazelle is not the only issue the AAC will have to wrestle with in the future. It will be challenging to replace, in future, the small fleet of enhanced Squrrel HT2 used by 670 Sqn for Operational Training, and the Bell 212 used in 25 Flight in support of training on Salisbury Plain and in BATUK. The replacement of the training fleet is inexorably tied to the UK Military Flying Training System PFI plan, and is putting the Army and the RAF into a fight over the future of 670 Sqn AAC in Middle Wallop. AAC candidates are first graded at ­Middle Wallop using the Grob G115 Tutor, and then sent to RAF Barkston Heath to gain more fixed-wing experience. ­They then move to the tri-service Defence Helicopter Flying School in Shawbury, where they train on a fleet on the Squirrel HT.1 trainer. For AAC pilots, however, the HT.1 is then followed by a 22-weeks course of Operational Training at Middle Wallop, which includes flying on 9 enhanced Squirrel HT.2. The HT.2 was created specifically with the Apache in mind, and adds several features which allow to download some of the training burden which would otherwise fall on the Apache training fleet itself. The HT.2 comes with a moving map display, a simulated ­defensive aids system panel and night vision goggle-compatible anti-collision lighting to support formation flying at night. Night flying is a key operational role for Apache crews, so training for night ops gets a great focus. Come 2018, however, the UK MFTS contract is expected to kick into higher gear by selecting the way forwards for replacing the current rotary wing training fleet and for restructuring how training is delivered, and where. In the fixed-wing arena, a sure loser is RAF Linton-on-Ouse, which will be cut off by 2019, when the fixed wing training pipeline will be completely renewed. In the rotary wing arena, the Army might face further pressure about Middle Wallop. The focus of MFTS is on the 24 Squirrel HT.1 and 11 Griffin used at Shawbury, and on the DHFS itself: the army, Flightglobal reported already back in 2011, is opposing the call to concentrate all training at Shawbury, because it assesses as vital the advanced courses run at Middle Wallop. The superior training value of the HT2 and of the AAC courses, as well as the position of Middle Wallop, in the middle of the action (near to Salisbury Plain and to major helicopter bases) are seen as a precious plus that the Army does not want to lose. The Army's voice might have managed to reach receptive hears, because in January this year the deputy commander of Joint Helicopter Command, Brigadier Neil Sexton went on record saying that the MOD is now looking at a Surrogate Training requirement as well, which might help cover the requirements. In January, the idea was described as having small fleet of smaller, cheaper surrogate training helicopters (six for each base) equipped with dummy systems and adequate human-machine interface to enable highly realistic training at lower cost. The pilots will need to be able to move seamlessly from the surrogate to the real thing. A key factor is that this requirement would be detached from the DHFS, which would continue to deliver Initial Training. The Army and the RAF will probably want to incorporate / attach other small-fleet requirements to these training fleet deals: for the RAF, the potential problem is replacing the Bell Griffin HAR2 used by 84 Sqn in Cyprus for SAR, support to training, firefighting etcetera. As its brother Griffin HT1 (used for training) goes out of service, it might be very attractive to get it replaced as well, to maintain the wider possible fleet commonality. For the army, the issue is replacing Gazelle in its irreducible roles, and the Bell 212. All will have to be done within a tight budget, making it all challenging. The Lynx AH7 is expected to bow out of service in March next year, replaced by the Wildcat, while the AH9A fleet is expected to keep serving out to 2018. Notoriously, all Wildcat helicopters are due to be eventually based in Yeovilton, under 1st Regiment AAC, which will absorb 9 Regiment as it moves south from Dishfort, "not before october 2015". The plan, as of today, is to preserve all five the squadrons of the two regiments, but have one (652 Sqn) as Conversion to Role unit. Conversion to Type, i believe, will remain in 671 Sqn AAC, which is the squadron with delivers CTT training for all AAC helicopter types bar Apache. This plan would give a force of four frontline squadrons (651, 659, 669, 672) sharing the same pool of helicopters and the same pool of ground crew and engineers. 847 NAS would also draw from the same fleet of 34 helicopters, while contributing a share of naval engineers to the pool, which it would draw for deployments on warships. The odd one out is 657 Sqn, Joint Special Forces Aviation Wing. It is to be assumed that this squadron will be the last user of the Lynx AH9A. In 2011, a plan emerged to purchase four additional Wildcat and convert four of the existing army order into a Light Assault Helicopter configuration, as replacement helicopters for 657 Sqn. The plan, however, did not progress at this stage, for reasons never clearly explained. A decision will have to be made at some point in a not too distant future about what to do. 32 Wildcat have already been delivered (20 army AH1 and 12 HMA2 for the navy), and 13 helicopters are due for delivery this year, with 18 expected the next (up from 15, on a request from the MOD to speed up deliveries). Deliveries of all 62 should be completed by August 2016 at the latest, anyway. ISD with the Army should be in August, while the Navy ISD is in January 2015. The Navy's Wildcat OCU, 825 Sqn, formally stands up on 1st August 2014, and is expected to have four deployable Flights next year, with which activities at sea will begin. The training centre in Yeovilton was handed over to the MOD in March 2013. The centre is delivering courses already, and it includes two Full Mission Simulators (FMS), a Flight Training Device (FTD) and a Cockpit Procedures Trainer (CPT), plus a suite of briefing rooms, integrated electronic classrooms and a learning management system. All simulators can be used both for Army and Navy training. Ground crew support for the Army Air Corps comes from 6 Regiment, which has expanded under Army 2020 to include 4 squadrons. 675 (Rifles) Sqn is paired to 1st Regiment AAC and will support the Wildcat force. 677 (Suffolk & Norfolk Yeomanry) is paired to 3 Regiment AAC, and supports its Apaches. 678 (The Rifles) is paired to 4 Regiment AAC. 679 (Duke of Connaught's) supports the attack helicopter force. 7 REME Battalion provides the ground technical support to all of the Army aviation. It currently has 3 Aviation Companies (71, 72 and 73) which alternate in Operational Role (deployable / deployed); Support to Training; Intimate Support. In Afghanistan, the Operational company breaks down in a multitude of detachments: UAV Det, AH Det (support to Apache), Kindle Det (support to Joint Special Forces Air Wing), Lynx Det. With the entry in service of Watchkeeper, the Royal Artillery is devoting one battery (74 Bty) to "UAS Support", but it is not clear if this is technical, maintenance support eating into REME territory. 7 REME also includes 8 Field Company (Parachute), which delivers 2nd line equipment support to 16 Air Assault Brigade. In 2012, the company had an establishment of some 150 men, and was made up by HQ, Forward Sp Platoon, General Sp Platoon, Support Platoon and the Airborne Forward Repair Team, which supports Drop Zone requirements and early movements of the brigade post-launch. It is pretty much certain that the company will be re-organizing internally to assume a binary structure to be able to provide, on rotation, a coherent full package of capabilities to the Airborne Task Force (ABTF). The ABTF is made up by 1698 men at R2 (readiness level 2; 5 days notice to move), including artillery, medics, engineers (a squadron of 135 from 23 Eng Rgt) and other supports. Logistic support for the Army Aviation is delivered by 132 Aviation Sqn RLC. Very good, informative article, Gaby. I am very pleased that you have included a section on the Army's fixed-wing component, a much under-estimated part of the Corps (although not, as you imply, under-valued by the Army itself). The Islander and Defender aircraft aircraft do a huge amount of invaluable work in surveillance and reconnaissance (including anti-terrorism work) etc. They can also be used in the light transport role and command/liaison roles. Sturdy and reliable, these aircraft are excellent and vital to the Army's work. I did not know, though, that a Defender had been employed in Afghanistan! Hi Gaby, excellent blog well done to you and all the folks who reply/contribute. Ive always wondered in the past has top brass ever considered moving most rotary wing assets under AAC control? Im talking mainly Chinook/Puma obviously Merlin is to be upgraded and transferred to CHF so its been?being done as we speak. The RAAF transferred their Chinooks albeit in vastly smaller numbers to Australian Army Aviation awhile back. Considering most flying hours (As I understand that is) are dedicated to ground forces support both financially and operationally would this make any sense? I understand more strain on Army budget but RAF could redirect funding to other projects (F35 ect) As a side note what is the future of Puma? when it bows out is it replaced? I do think that the Support Helicopters should indeed be out of the air force's hands, and directly in the hands of the Army, which is the main user anyway. But no one in the UK has had the courage to try and flesh out a plan for the transfer. 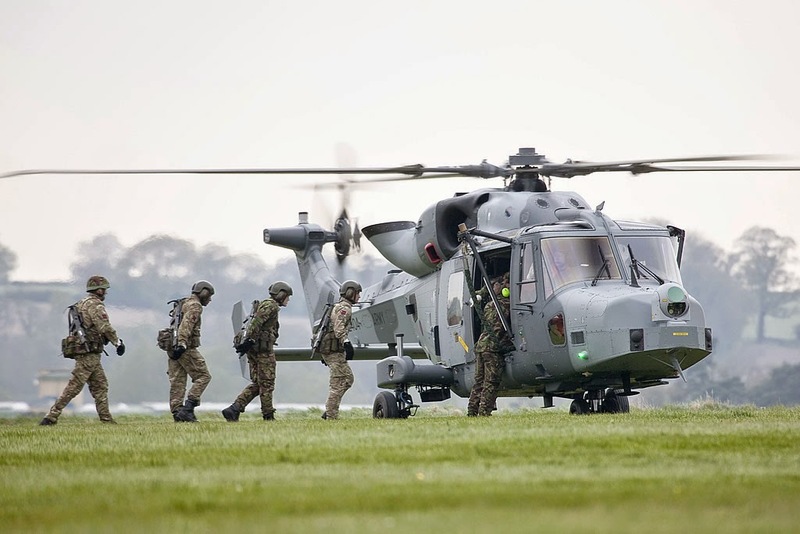 Instead, the "solution" was to form an additional 2-star HQ, Joint Helicopter Command, which puts all helicopters (save Merlin HM2 and the naval Lynx/Wildcats) under Land HQ control, while leaving them in RAF hands, and while adopting more or less the operational tour guidelines of the RAF. Was it the right choice? I don't quite think it was. However, trying to flesh out a transfer plan today would be quite a demanding exercise, due to the size of the fleets involved, and the manpower and financial lines connected to them. Any transfer would have to come with a big review of the manpower and budget of both the Army and the RAF, and i guess no one wants to deal with such an enterprise. As for Puma, what happens after it is a mystery. But it might not be replaced, as the ministers have often talked about standardizing the line on four types in the future: Apache, Wildcat, Merlin, Chinook. Just picking up on your last point around Puma. I can certainly see it not being replaced by an equivalent, but do you believe that the two squadrons would simply be deleted or whether the Merlin and Chinook fleets would be increased somewhat to compensate for the loss of another 24 airframes? One of your best articles recently Gabriele. Agree with other posters 5 Reg AAC's fixed wing fleet little reported. Love the Gazelle writeup. I do believe 665 Squadron ( you wrote 655 ) did also operate the Lynx. Fascinated that 658 still have 2 Gazelle, and would love to know the role. Concerning MFTS I would be most surprised if RAF Linton on Ouse is closed, as I think you imply, as 1 FTS has a dedicated LFA in that part of the UK, much like the Rotary LFA in Shropshire for Shawbury. I would think the existing FTS would remain in their locations. just with their aircraft renewed, and part privatized ( again :-( ) I'm pleased that 4 FTS escaped this, but that is going off topic with AAC. Corrected the Gazelle squadron number. Was a classic keyboard slip. Linton-On-Ouse perhaps won't close entirely down, but the fast jet training pipeline will leave in the next five years. It is the official plan at the moment. Its future demise for fast jet training is spelled out clearly in the article about Military Flying Training System in the RAF Yearbook 2014 (Airpower 2014/15, download here: http://www.newsdeskmedia.com/publications/categories/defence). RAF MFTS (Fixed Wing) is expecting to bypass Linton and do everything in Valley in the future as the Tucano goes out of service and is replaced by a new trainer. Already 1 FTS is down to just 72 Sqn after 207 was disbanded in 2012 due to the general shrinkage caused by the SDSR cuts. Further reductions are expected, so much so that training of foreign personnel is expected to forcibly downsize due to lack of room in the system... So, i'd say it is already happening. Thanks will have a read of it. Didn't 55, 76 & 85 squadrons flying the Dominie, Tucano & Tutor respectively also disband around 2011 as a result of the SDSR? I've been trying to find information on the future of the RAF's training fleet for a while. Do you think we will see anymore Hawk T2's ordered to replace the T1's used by 100 squadron, the Red Arrows and the FAA? What about replacing the Tucano, any good contenders yet? I've heard rumours that the RAF may pursue some kind of private finance contract for some or all of the basic training it current does on the Hawk T1 & Tucano. 55 did disband, and RAF rear crews currently make do by getting a ride on the Beechcraft 350 Avenger used by the Royal Navy in 750 Sqn. A better solution is expected by 2019 within the FOC of the Military Flying Training System PFI. 76 and 85 also disbanded, yes. More Hawk T2 are unlikely any time soon. I understand that the Hawk 1 out of service date has been moved to 2020 to gain time to decide how to replace it. The Fixed Wing training pipeline should be renewed completely by 2018 (bar the Hawk 1 squadrons which pose a different challenge) and the supposed (unconfirmed for now) preferred bidder is a Elbit-KBR team which would replace the Grob G-115 with the Grob G 120TP, the Tucano with the Beechcraft T-6C and the Embraer Phenom 100 replacing the Beech King Air 200 for multi-engine training (and rear crew?). The Embraer Phenom is a weird looking choice for me, when the RN has just renewed under MFTS the rear-crew training using 4 Beech King Air 350 which are also the base of the Shadow R1. Why not use more of them for multi-engine training, i wonder...? The Hawk equipped units such as 736 NAS and 100 RAF will be trickier to replace due to their very specific role as "aggressor" squadrons of sort in support to air defence, JTAC training etcetera. Plus, there are the Red Arrows too, of course. Don't think much is known about what to do in this area, at the moment. More Hawk T2 might be considered, one would think, but i guess it is far from an automatic choice. I would hope for a small follow up order for Hawk T2 to replace the Red Arrows fleet, and a few more for 100 Squadron, FRADU. I read the article you linked, you are correct re Linton on Ouse, I had not read that. Do they propose using the same airspace for basic and advanced fixed wing training as well as basing all at one airfield? I don't know how air space would be managed. My feeling over the subject is that in the near future 208(R) squadron's place in Valley will be taken by a single squadron of Basic Trainers replacing the Tucano currently based in Linton. 208 has survived (for now) mostly due to the contract signed for training Saudi Arabia pilots, with the course beginning in 208 Sqn in february 2013. Thanks for the information Gab, all quite confusing from my uninformed position! It makes sense that the respective training fleets would shrink in line with the rest of the RAF as demand dropped after the SDSR. Looking into it the Embraer Phenom looks weird to me as well, commonality with the RN multi-engine platforms as well as 14 squadrons Shadow R1 makes far more sense. I'd be surprised if at least a few more Hawk T2's weren't eventually ordered seen as it's a very effective choice and commonality with the wider Hawk fleet would be a real incentive, is their really any other logical contender? So the future in your opinion is single Hawk T2 and Tucano units (4 & 72 squadrons) at RAF Valley and elementary training done by 16 squadron at Cranwell, with Linton-on-Ouse either closing or finding another role? What about 57 squadron? Is it still active with the Grob Tutor as well or is that outdated information? Air training in the UK and units related to training, cadets and all that are a huge and indeed confusing subject with lots of under-reported changes having happened in recent times. But bear with me for a little longer: i've actually decided, after this exchange of comments, to write an article on air training. It'll be out in the week with all the details. 57 Squadron is still active, is due to move to Cranwell. OK, i'll look forward to reading it! I forgot to mention that a few years ago there was a plan to use an unmanned version of the Gazelle helicopter.. The idea was use the aircraft to fly from naval vessels in order to carry out intelligence, reconnaissance and surveillance tasks. I believe that both Qinetiq and Northrop Grumman were involved in the scheme. I don't know whether the plan is still alive or whether it has been quietly dropped. Conversion of Gazelle to a UAS was offered for the Royal Navy RWUAS demonstration programme, but as we know the AgustaWestland SW-4 SOLO was selected in the end. For now, there is no ongoing plan to convert Gazelle into UAS. Taking a look at Australia's plan BEERSHEBA would AAC gain from a formation along the lines of 16th Aviation Brigade? With deployable HQ and ground support much easier for training with 16AA seems better than current JHC which seems more admin based to me? It is hard to say if it would be beneficial or not. 16AA gets an aviation HQ supplied not by JHC itself (which is indeed a division-level admin command) but by the attack helicopter regiments. Apparently, this is assessed as sufficient. A different organisation might or might not work better, but from the outside it is hard to judge. When did Col Cash speak? No link provided. You know, it is funny that you spend your time insulting me on Twitter and on your website, then come crawling here to be informed by me. I know who you are. More than once i've been kind and i've even answered to you. Now, instead, i think i'll enjoy the magic of the "delete comment" button. As always a very detailed and informative article. As I read the situation/plan for the Apache, 2 Regiments are planned. One to support 3 CDO BDE and one to support 16 AA BDE? If this correct, I assume that the 3 Deployable brigades, the adaptable brigades and all other army units will be without an any attack helicopter support? 2 Regiments alternating into High Readiness. Each regiment has two squadrons, and the regiment at HR R2 will devote one sqn to the ABTF and one to the RFTG. The brigades will have access to some attack helicopter during training, and would of course get supported when deployed. But, as it always was, they don't have a regularly attached attack helicopter capability. The squadron devoted to the RFTG is already a step forward by itself, since, also because of Afghanistan, the AAC has never so far delivered more than small packages of helicopters (never more than 4 / 5, even during Ellamy) for use on ships. Have we ever taken helicopters from trade? I remember reading years back regarding Bristow helicopters super pumas possibly an option? I know this would only happen for a Large scale mobilisation like the merchant ships in '82 (STUFT) for the fallklands war. We grabbed the Merlins from Denmark for a UOR the HC3a variants. I understand Phil's point regarding attack heli-support for the brigades if we need to would/could we borrow UOR? During a major crisis it would probably be attempted to surge helicopters from whatever source, but how practicable / effective it would be, is questionable. In Afghanistan a degree of helicopter mobility was contracted / chartered by NATO from civilian contractors, but that was about it. Hi Gabriele, stumbled across your blog whilst writing my own for the 7 Air Assault Battalion REME Field Gun Crew. I'm not sure how fitting my blog is for your commentary but it may be something that you would like to take a look at. Thanks, i'm taking a look right now, and reading the story of the field gun competitions. Interesting, for sure.